WOW!!! GORGEOUS BRICK RANCH ON 1.2 ACRES IN ONE OF THE NICEST SUBDIDVISIONS IN FISHERVILLE! OVER 2100 SQ FT ON THE FIRST FLOOR PLUS AN ADDITIONAL 2100 SQ FT IN THE UNFINISHED BASEMENT! FROM THE CHARMING COVERED FRONT PORCH, ENTER THE LARGE VAULTED GREAT ROOM WITH GLEAMING HARDWOOD FLOORS AND BEAUTIFUL WOODBURNING FIREPLACE! LARGE EAT-IN KITCHEN WITH MAPLE CABINETRY, NEW GRANITE COUNTERTOPS, NEW CERAMIC TILE BACKSPLASH, CERAMIC TILE FLOOR, AND BAY WINDOW! SPLIT BEDRROM DESIGN OFFERS PRIVATE MASTER SUITE! THE MASTER BEDROOM HAS TREY CEILINGS, AND 2 LARGE WALK-IN CLOSETS! THE MASTER BATH IS AWESOME WITH HEART SHAPED WHIRLPOOL TUB, SEPERATE SHOWER, BEAUTIFUL GRANITE DOUBLE SINK VANITY, AND LINEN CLOSET! ON THE OTHER SIDE OF GREAT ROOM IS A BEAUTIFUL FORMAL DINING ROOM WITH HARDWOOD (cont)FLOORING. CONITINUE DOWN THE HALL AND YOU WILL FIND 2 ADDTIONAL BEDROOMS, ANOTHER FULL BATH WITH GRANITE TOP VANITY, AND A SUPER 1ST FLOOR LAUNDRY ROOM! ALSO THE STAIRWAY LEADING TO THE HUGE BASEMENT WITH HIGH CEILINGS. COULD BE FINISHED WITH THEATRE ROOM, FAMILY ROOM, EXERCISE ROOM, ETC. ALREADY HAS ROUGHED IN PLUMBING FOR ANOTHER BATH! YOU WILL LOVE THE SIDE-ENTRY 2 1/2 CAR GARAGE, AND WIDE DRIVEWAY! ANOTHER GREAT FEATURE IS THE HOME HAS FULL ELECTRIC FENCE FOR YOUR FURRY FRIENDS! 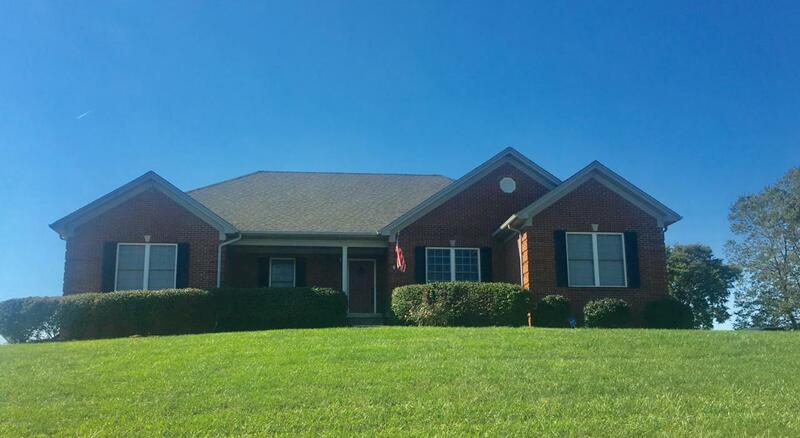 THIS HOME OFFERS SPECTACULAR VIEWS AND IS CONVENIENTLY LOCATED JUST MINUTES FROM THE GENE SNYDER FREEWAY AND LOUISVILLE! TRANSFERRED OWNERS ARE READY TO SELL! BETTER HURRY ON THIS ONE! Eat In Kitchen Remarks Granite Countertops And Bay Window! Master Bedroom Remarks Trey Ceiling 2 Large Closets!